It was the fall of 1993, and I was dragging my small children with me to the first ever Master Gardener training program for my home county, Mercer County, in New Jersey. Barbara Bromley, the County Horticulturist, introduced the class to the Asian ladybug just as swarms of them started coming into all of our homes to overwinter, finding our homes the closest substitute to the Asian cliffs they were accustomed to. That year, we were not amused. Although some of my fellow Master Gardener trainee colleagues were clearly entertaining even more numerous populations than we were, they still seemed to be everywhere in the house, crawling on everything and subject to numerous accidental squishings that tended to leave a stain and a somewhat nasty smell. And, I, of course, didn’t want to kill them, but if we put them outdoors, they probably found their ways back in. I imagine there was a lot of killing by my husband when I wasn’t looking. More than 20 years later, the infestation is down to a few. I thought it was only one (and one dead one, with the live one ceaselessly walking around my bathroom), but today, I saw two at once, both alive and crawling. 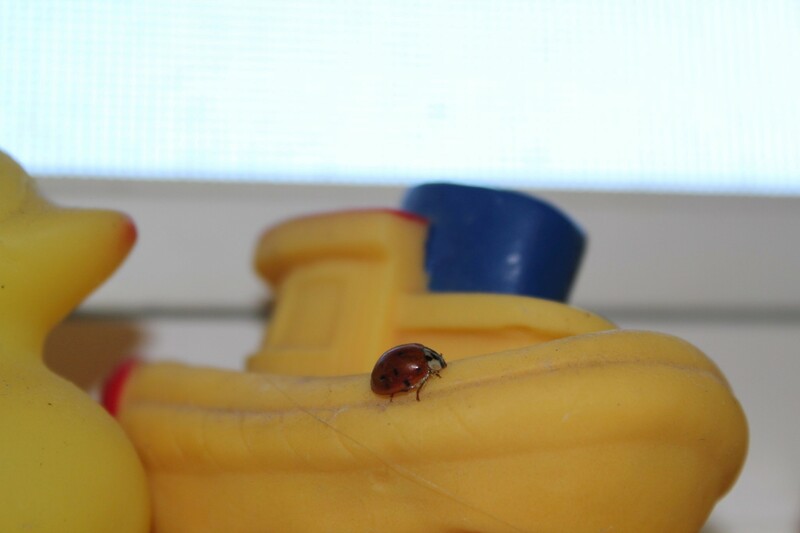 I look into the tub very carefully before I shower, and have rescued a ladybug more than once from a surface that surely would receive a flood during my shower, which would send the bug down to the drain. This is the first of two posts. The second will be about things a gardener should know about both native ladybugs and Asian ladybugs, but this post asks—does it matter? Should I save that ladybug, those ladybugs, time and again? I have to start with my childhood literary references—things that formed my conscience and my sense of our responsibility to the other organisms on the planet. In Ray Bradbury’s short story A Sound of Thunder, which I mentioned in my last blog post, the death of one butterfly leads to profound changes in the world, ultimately bringing a totalitarian regime into existence. And then, there was Robert Heinlein’s Stranger in a Strange Land, which I compared to Eugene O’Neill’s Lazarus Laughed in a school paper written in my high school senior year. Okay, anyone my age remembers the Heinlein book for two things: the hippie-like, grokking free-love society that the main character starts, and the fact that the book was supposed to be partial inspiration for Charles Manson’s free love society and the murder of Sharon Tate. A Wikipedia article claims this was later proven to be untrue, and Manson had never read the book, but I bet it’s a memory regardless. The main thing I remember of the book? Valentine Michael Smith, the Earthling raised by Martians, faced with an apartment where the living room had a rug of lawn grass (it’s the future, and apparently outside lawns are very rare), is appalled by the idea of walking on living things. Leaving that logical—or logistical—problem aside, as I now know that we can’t walk anywhere without walking on living things, most of which are microscopic, let’s agree that, philosophically, we don’t want to harm any more living things than necessary. But, should we be actively trying to save them—and how actively? The Asian Ladybug, as its name implies, is not native. They were intentionally introduced to a number of states in the U.S. by the United States Department of Agriculture, especially during the 1970s and 1980s, to act as a beneficial insect that would eat plant pests such as “aphids, scale, and other soft bodied arthropods.” They have clearly spread across many more states, including New Jersey, than those to which they were purposefully introduced (there are various references to possible accidental introductions, leading me to believe there must be some pretty good evidence of this). Clearly, the Asian ladybugs are competing with native ladybugs for increasingly scarce food. Next week for the newest blog post, I’ll be talking with a representative of a Cornell University project, the Lost Ladybug project, to answer questions and clear up misconceptions. But the web is full of questionably panicky assertions, such as that the Asian ladybugs eat natives. I also saw something that suggested ladybugs in general eat corn borer larvae, so I asked George Hamilton, the Chair of the Entomology Department at Rutgers University, about both the ladybug and corn borer eating—and he confirmed that ladybugs, Asian or otherwise, do neither. Okay, that’s good. But my Asian ladybug is walking around an awful lot at a time when it should be in diapause, which Hamilton indicated was the word for insect hibernation. I asked him whether this activity would cause it to die, and he indicated that it could, indeed, lead the ladybug to expend all of its fat supplies before it could leave my house for the outside. So, my Asian ladybug could die regardless of my best efforts. Or, it could live, and threaten the survival of native ladybugs. Maybe, my saving the Asian ladybug in my bathroom is what will lead to the creation of the totalitarian regime of A Sound of Thunder. So tell me what you think, and tune in for the next post on how you can help encourage ladybug survival and awareness. Am I being superstitious or karmic to believe that every time we casually and callously bring about the extinction of a creature or plant, we are moving ourselves towards our own extinction year by year? I have in my mind a chart from the wonderful Ray Archuleta (if you don’t know him, everyone should). Ray is a soil scientist with the USDA Natural Resources Conservation Service who has a schematic (see below) of interconnected organisms in healthy soil. As the schematic shows, each organism is crucial to the survival of the rest. When something we humans do kills one kind of organism, it often leads to collapse of another species, and so on. Soil health is lost, and the whole network begins to collapse. So too, with extinctions—I believe that Earth’s ecological network will begin to collapse. We humans cannot believe ourselves immune, since we, too, are one of Earth’s organisms that is supported by many others. And we are supported by not just the animals we keep as livestock and the plants we grow in neat farm rows. Could we live if we wiped out all species except those we utilize to create food, clothing, shelter, and the other “things” of our lives? I fear that we will wake up one day to a catastrophic collapse in systems that seems like it happened overnight, but really, is the sum of all the extinctions we have left in our wake. It could be happening some places already. It turns out that Guam, the island where I spent my senior year of high school, could be the place where something like this gets played out first. Since the loss of the flying-fox, Guam has experienced a cascade of extinctions, brought about by the introduction of the brown tree snake (Boiga irregularis). As a result its forests are now largely silent, the island having lost many of its pollinators and fruit dispersers. The fate of Guam’s ecology in the wake of such destruction should be of much interest to biologists, as many regions may come to resemble it in future. This quote, from a wonderful book called A Gap in Nature: Discovering the World’s Extinct Animals, seems carefully worded to me, leaving the horror of extinctions on an island scale to the imagination of the reader. The book was a four-year project of Tim Flannery and Peter Schouten, who together, examined written and museum specimen evidence for hundreds of extinct or possibly extinct animals, and then chose 123 of them for which the evidence was sufficient to create a life-size portrait of the animal in its known native habitat before extinction. The paintings are stunning, even reproduced and less than full-size within the book. The stories of extinction are stunning too, partly in their similarity. When the first humans would arrive at an island that had never seen humans, the creatures there were curious about this new life—to their peril, since humans would bludgeon or stab the curious creatures easily. When only a few remained, people eager to add to their collections of stuffed zoological curiosities consistently shot the last of the species. Or, cats, rats, foxes and snakes that humans brought with them, whether by chance or on purpose, generally made sure that any survivors disappeared. So, what would life in the future look like for Guam, with its ecology wiped out? We can keep the island humans on life support by importing all the food they need. Even when I lived on Guam, many of the necessities like milk were imported—there weren’t any cows, and no real farming, that I could discern. So, we drank a reconstituted milk called Milkman, and lots of Hawaiian Punch, which I thought was sort of ironic at the time. But what if the plants just start vanishing, along with the pollinators? Or at least the native ones? How much ecological life support can we sustain? Will Guam be able to show us how fragile the “web of life” is, and our own need for diversity of species? It could be that I am also influenced by my childhood love for science fiction. In the famous short story, A Sound of Thunder, by Ray Bradbury, humans invent a time-travel system that allows wealthy humans to travel back and see the dinosaurs and other ancient creatures. In order that time not be changed, the traveler must remain on an elevated walkway. One traveler leaves the walkway for long enough to kill a butterfly. On his return to the present, the man discovers that a Nazi-like society has taken over the world, just from the changes cascading down from that one death. How much more must the death of a whole species of individuals change the world? I have the great privilege of being a part-time garden educator for two K-5 schools in Princeton, New Jersey, a town that has had a commitment to garden education for over a decade. Generally, I am rushing around one of our school gardens either prepping a garden bed for a class that is coming out in 15 minutes or using a few spare minutes to weed and mulch. But, I had a few minutes to just sit in the Community Park School “Edible Garden” one beautiful day this fall. I had set up for a weekend garden event and was just waiting for people to arrive. On a bench in our classroom/seating area, I enjoyed the rare opportunity to slow myself down. For all my protestations about people just needing to get outside and observe more, and my tossing about of the phrase “nature deficit disorder,” I was rather shocked to find the garden full of critters—birds, bees, butterflies and more, all acting as though I weren’t there. Only a few feet away from me, a quite bold squirrel flung him or herself off a tree branch onto one of our tall and lovely corn stalks, grabbed tight, and waited as his/her weight bent the stalk down to the ground. I’m pretty sure that’s when I called out, “hey you, squirrel!” It did occur to me, irrationally, that we needed a better name than just “squirrel” for our little friend, but in an instant, I had discovered who was stealing the corn from our corn patch. I wasn’t going to let our new friend steal another ear of corn, at least while I was sitting there! True confessions: having saved an ear of corn, I somehow magically believed the squirrel (or squirrels) would never steal every one. But our squirrel did just that, scattering empty husks around the Edible Garden. I had been planning to bring the fourth grade classes out to pick our lovely Indian corn, from seed donated by my friend Zane. But, having been reminded that a garden is not another human room, but a place where we are invited to share space with lovely living things, I created new lessons to let the kids experience the same reminder. I asked each fourth grader to solve the mystery of the corn theft. Each student had to find clues to the thief’s identity, and use them to come up with a conclusion. I also created a game of “critter bingo” to ask the kids to see who else besides our corn thief was sharing the garden with us. Students didn’t actually need to see a critter, but had to come up with clues that suggested that critter had been there. From the kids, I learned where every hole in our fence was, and the location of some probable rabbit or vole holes. We had a great discussion, considering seriously even the possibility that deer might have been here (in spite of our very tall deer fence). There are probably still some kids who believe the deer steal in by dark of night. In spite of my many years of being a gardener, and in spite of my burning desire to get kids outside more to experience nature, it took observing the squirrel to remind me that the critters and the plants are much more full-time residents of the garden ecosystem than we humans are. We humans count mainly as visitors. The critters and plants freely invite us in to spend some time in a place that is shaped by humans, yes, but even more by non-humans—from the living soil, which contains more organisms per square inch than any other segment of earth—on up through the wonderful shading trees. I am indoors as I write this, dreaming my way into the lovely private CP Edible Garden at a time when the ground is frozen. Me and the kids are really going to pay attention to the garden’s full-time residents this year, looking at the underside of leaves for insects, marveling at the small black voles that just love to hide under a flat of parsley plants and slowing down enough to see the birds. Of course, we also have to come up with our name for the squirrel, one that will describe what he/she teaches us. 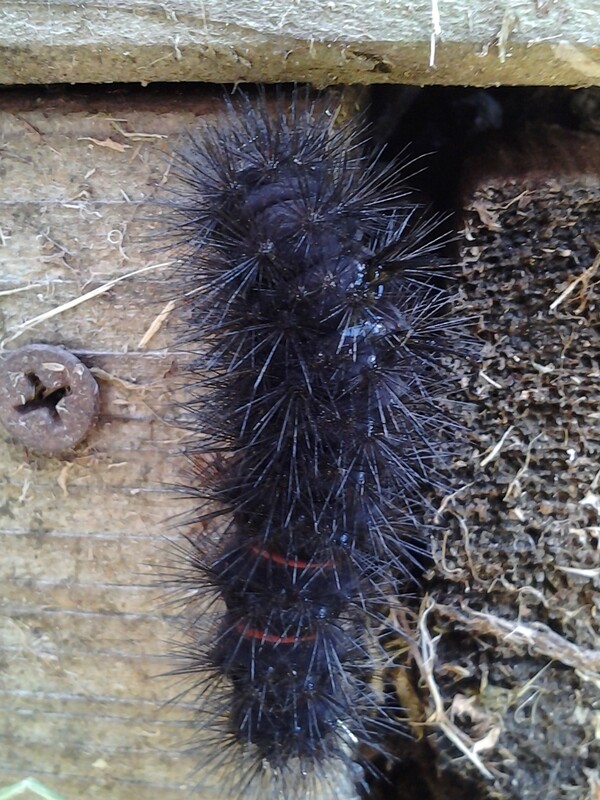 This is not a squirrel–it is a giant leopard moth larva that appeared equally magically in our garden. Okay, I will confess that my favorite of all the field trips I recommended on the “Democracy Bucket List” is a trip to a materials recovery facility, or a MRF for short. 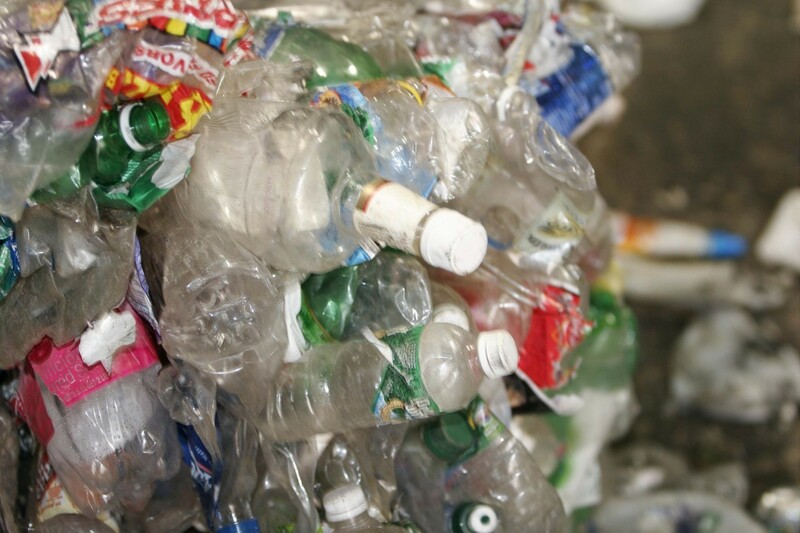 If you are a conscientious home, business or school recycler, you are setting out just the right mix of bottles, cans, jars, other containers, paper and cardboard. You are making sure you aren’t sending anything your town or county doesn’t accept. But what you send out is still very much a mix, which, if left as is, is of no use to anyone who is actually trying to make something new out of them. This becomes obvious when you consider what is in there. 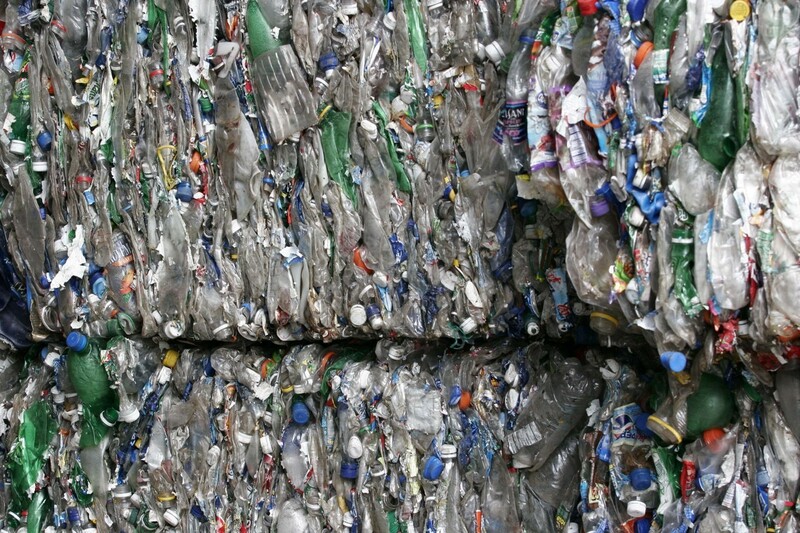 Someone trying to make new aluminum cans or mold aluminum or steel parts for cars or planes couldn’t use a raw material that includes plastic, glass, maybe paper, and cardboard—not to mention lots of labels and glues and other things that are on the outside of things that get recycled. 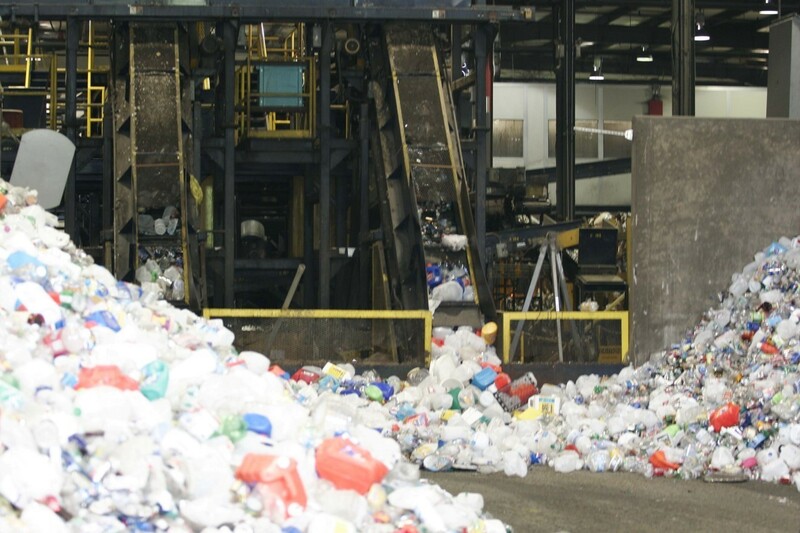 There is a long process to sort all collected mixed recyclables into pure material streams. This process starts at a facility called a Materials Recovery Facility, or MRF. I always describe a MRF as a kind of giant “chutes and ladders” game, since it involves materials going up and down all sorts of conveyor belts, past blowers and magnets. I have included a MRF on my “bucket list” of places all thoughtful citizens should visit, not least because it is so entertaining. What you want at the end of the MRF process is a mostly a set of bales. Each bale should be composed of castoffs which are uniformly of one material, such as number one plastic, polyethylene terapthalate or PET. Or, you want uniform piles of things like glass, which tend to break rather than bale. The sorting at a MRF gets more sophisticated all the time, but it isn’t idiot proof. If someone puts a plastic bag in, that bag will surely get tangled up around the sorting machinery, and the whole sorting line will have to stop long enough to have the bag removed. Since lots of “someones” put plastic bags in all the time, MRFs have to hire people to stand, all day, at the beginning of the first conveyor belt to do nothing but remove bags. NO MRF I HAVE EVER HEARD OF ACCEPTS PLASTIC BAGS. PLEASE TAKE THEM TO YOUR LOCAL SUPERMARKET, AND NEVER, NEVER PUT THEM IN YOUR RECYCLING BIN! Beyond plastic bags, there are lots of things MRFs don’t accept. Again, no MRF I ever heard of accepts window glass, broken dishes or even broken drinking glasses. The glass in these items is incompatible with the “recyclable” glass found in bottles and jars; in particular, it has different levels of lead in it. In my town, we are allowed to include clean aluminum foil in the mix of things we put out in our bins, and I really don’t remember ever seeing that before anywhere else, so I am still getting used to it. SO DON’T PUT IT IN WITHOUT EXPLICIT INSTRUCTIONS! It is important that you find out what is recyclable where you are, because when you add things to the mix that aren’t accepted, they can cause no end of problems, as plastic bags do. All recycling instructions include a direction to remove all caps from bottles or jars, but this is something hardly anyone seems to pay attention to. Let’s take soda bottles as an example: lots of people drink part of a soda, carefully screw the top back on, and drop it into a recycling bin, thinking they have done their part. But the MRF is designed for empty soda bottles, which are light, and can be moved by blowers onto the proper sorting line. Those with liquid still trapped inside physically don’t act like bottles, and often end up simply getting discarded, because the sorting process just cannot handle them and will just kick them out. It is important to remove the cap even from EMPTY BOTTLES, because as the capped bottle gets crushed during the baling process, the trapped air inside will make the bottle hard to flatten, and often such bottles start popping out the sides of bales, taking their neighbors with them. And maybe soon, I’ll invent a MRF chutes and ladders game. I think that there should be a participatory democracy bucket list of trips every citizen has to take at least once so they begin to understand how our society and culture work within the context of the bigger and “real” world. By real world, I don’t mean our financial system, which to me, at least, has always seemed to place value on things more derivative and uncertain than real—futures, predictions of stock values. The real world is our planet, the world that includes us and all our human created systems, as well as all the natural resources and systems, which we and other organisms depend on for food, water, air, shelter—the basics for every living thing. What’s on this bucket list? Being the “trashy” person I am, the first tours I would recommend would be 1) a landfill, 2) a facility where recyclables are sorted (otherwise known as a Materials Recovery Facility or MRF, and the subject of an entire post to itself), 3) a sewerage plant, and 4) maybe a drinking water treatment plant. This would lay bare the apparent Star Trek-like magic that whisks away our waste to somewhere where it will never trouble us again. Hopefully, in particular, it would give the viewer the motivation to learn exactly how not to waste and what should be recycled, and, perhaps more importantly, the motivation to be consistent about both avoiding waste and recycling wherever they are—not just at home. The sewerage plant and drinking water plant would hopefully impart a bit more respect for the system that delivers water straight into all of our buildings with little to no effort and labor on our part (except for those cases of bottled water), and just as easily, zips “wastewater,” aka sewage, out and away. What’s next? Everyone should do some food system field trips. Arrange to visit your local farm, and see what it takes to create the food that none of us could live without. Luckily, in my part of the country, we are blessed by a number of local family farms that grow delicious produce and raise animals for meat on a scale that doesn’t seem to merit the word “factory” in a scornful way. Some of these farms sell “agro-tourism” along with the produce, so you can take the family here to see some chickens, a few horses or cows. The fact that the farmer is providing you with some entertainment shouldn’t distract you from the serious business of farming, so just look a little closer. Look at the crops pushing up through the earth, maybe try to time your visit to a time when some picking, either by hand, or with a machine is being done. You could even ask the farmer, if you can find him or her free from chores, about the hours they keep and when was the last time they enjoyed a vacation. Finally, I also think everyone should have to visit a prison. During my first year of law school, my criminal law class took a field trip. We visitors were afraid to look at these people in cages, either because they were scary or because it had the feel of a zoo, except there were people locked up. Like a zoo, it will inspire mixed feelings about what has led to so many living things locked away. Any of these visits can help inspire you to step back and think about how the choices we make for ourselves project onto the world around us even if we don’t realize it, and how we always have room to improve.